Very good nihari, outstanding Kulcha & some great Biryani sum up this signboard -less eatery in a narrow lane of Lucknow. 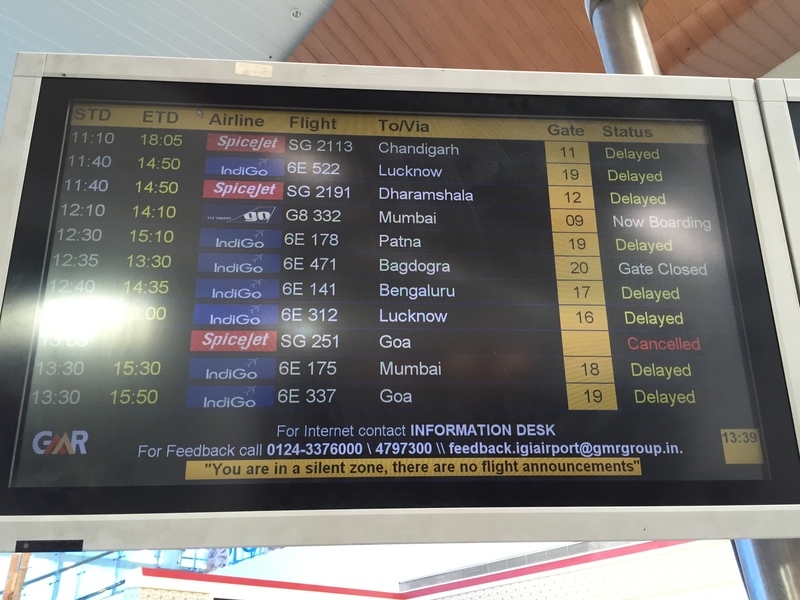 all flights delayed, all trains delayed – what a day to travel to eat!!!! 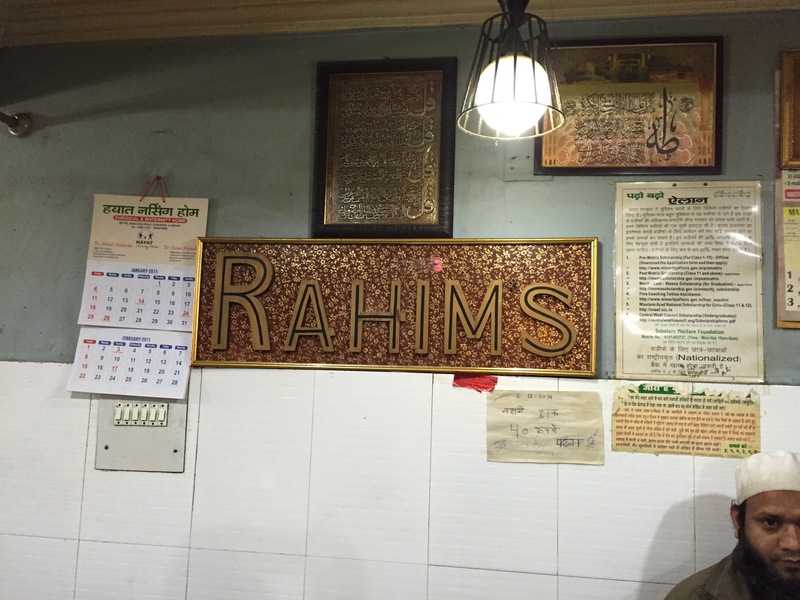 Had been hearing about Rahim’s from my friend YUMMDOOT & from my foodie friend Rakesh – both of whom wrote this post earlier. Was every eager to go to Lucknow to try it out. Reaching the shop was quite a task. Zomato lists another shop with the same name spelled differently – Raheem. Google map did not show Rahim’s. Human GPS helped again, in addition to help by YUMMDOOT who helped to point it in the map. 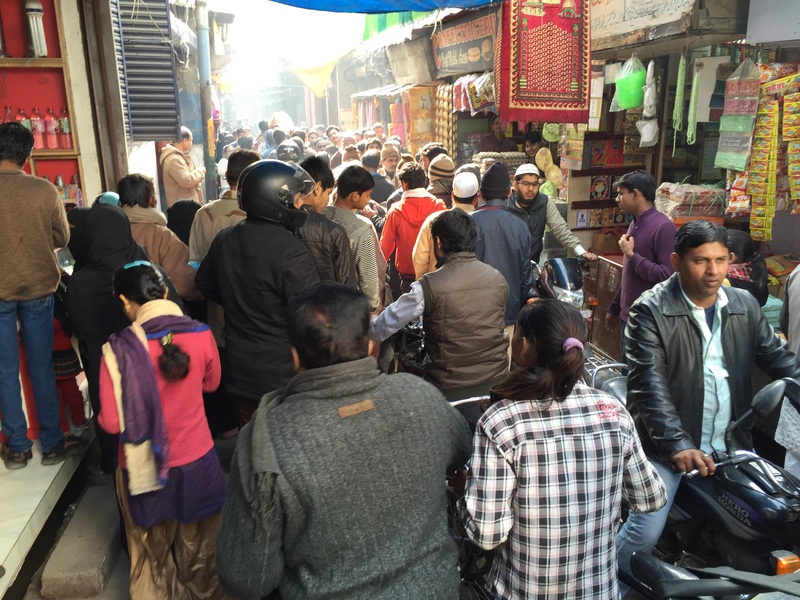 The road leading to the shop was narrow & we faced Human traffic jam!!! There were too many two wheelers, human beings, each jostling for space. No one cud move on their own & had to move with the flow of traffic. The shop does not have a signboard outside. The eating area is Basement (non A/C) and first floor (family section). We chose the basement to get a real feel of the place. The entrance to the restaurant is on the road level. It has a tandoor on one side & a kabab set up on the other. The dining area in the basement was modest & clean. On the wall behind the counter I saw the logo of Rahim’s. The waiting staff were very warm, cheerful , alert & super efficient. Enjoyed my little animated chats with them. There was no menu card. The waiter rattled away the items available & we chose. Food was really good. Loved it. We started our lunch with Bakre ka nihari (goat nihari). For the uninitiated, nihari is a meat curry cooked in slow fire over night with spices & special herbs, thus making the meat ‘super soft, melt in the mouth’. The nihari at Rahim’s was very different from nihari we have been having in Delhi, b it the karims type or Kallu type. This one at Rahim’s was comparatively thinner, was less ‘on the face’ , was very different from the Dilli ones coz this one had layers of flavours that were beyond subtle but less than robust. The layers of flavour were truly enjoyable. Rate the gravy 4.5/5. 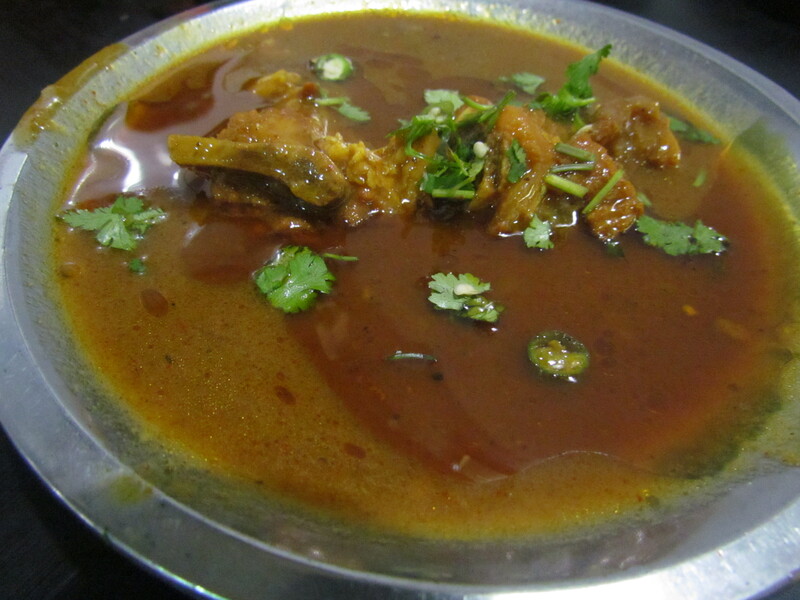 The meat of the nihari was not at all melt in the mouth like the one at Kallu or karims or even lucknow’ s own Idris. 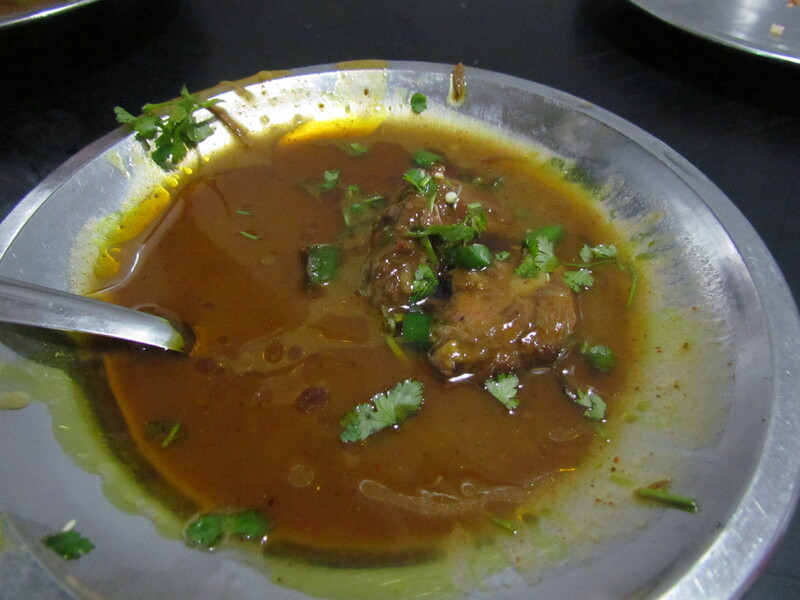 The meat at Rahim was soft but a tad fibrous – something that I have never experienced b4 in a Nihari. It was tasty meat though. Rate the meat 4/5. The meat of bade ka Nihari was fibrous and somewhat soft. 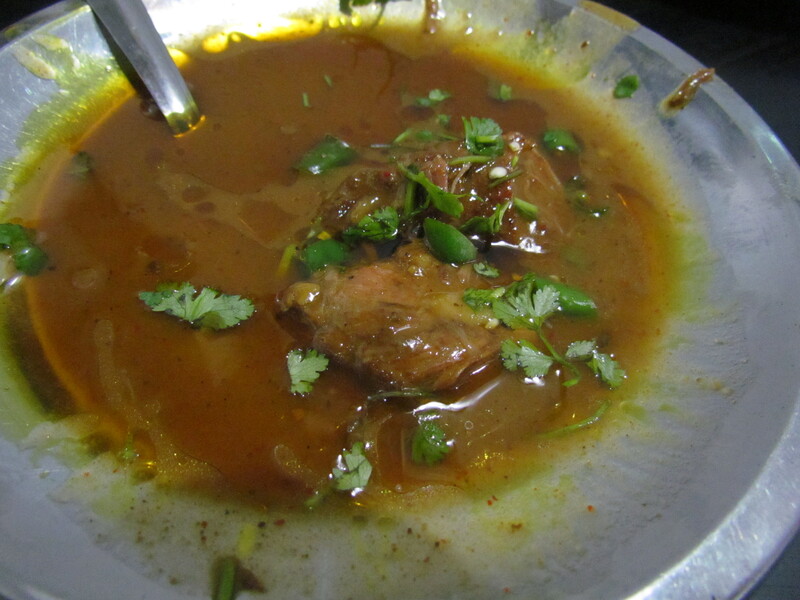 Once again, something that I had never experienced in any Nihari. It was however tasty and full of flavours. I Wud rate the meat 3.5/5. We NJOYed the niharis with Kulcha that was nothing short of ‘outstanding’. 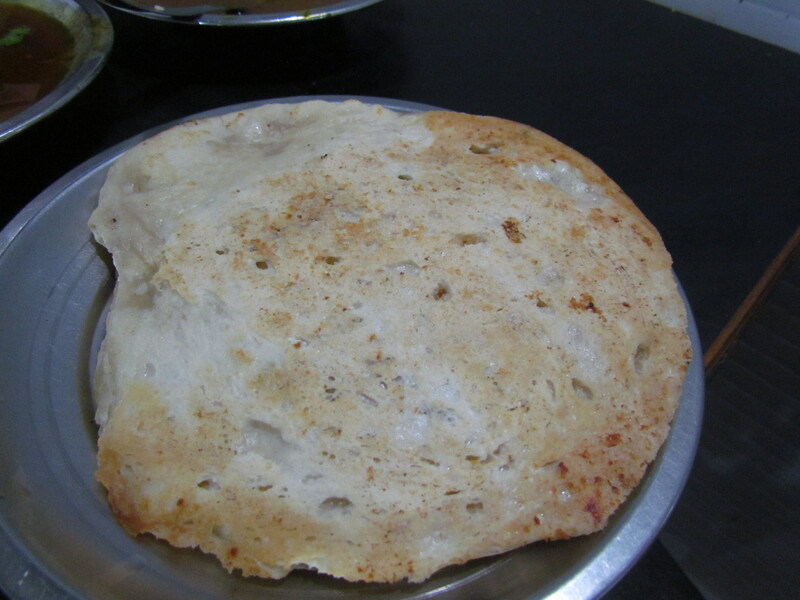 It had a flat side (the side that sticks to the tandoor) & a swollen side (the side facing the heat). The swollen side was crisp, flaky and very nice to taste just as it is. The mid part was soft. 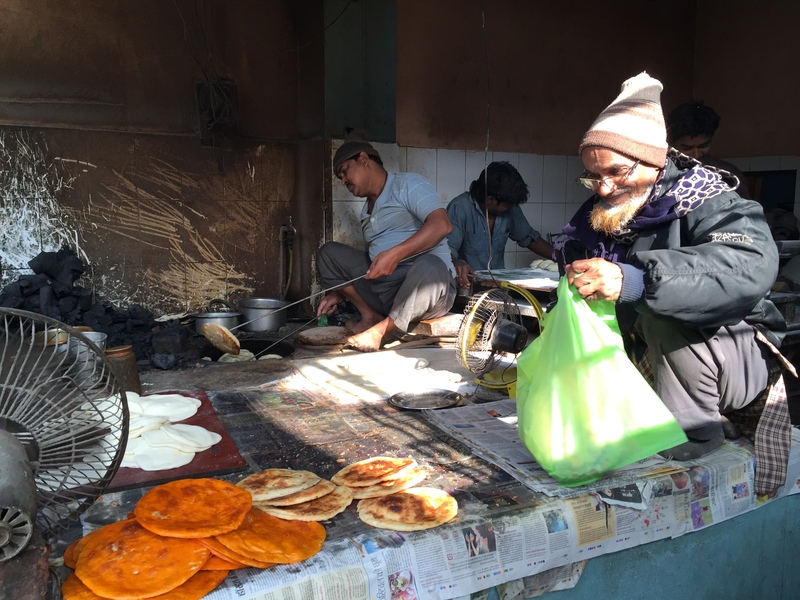 Eating this kulcha made me feel that a English lady had shared a croissant recipe with her cook and he used some of that idea to …. come up with an amazing bread or just vice versa. It was somewhere between a croissant & a tandoori kulcha. The mutton pieces were extremely soft and melt in the mouth. Not at all fibrous.The pieces retained the flavour of mutton as well had flavours of spices. Rate the mutton pieces 4.75/5. Overall rating of food at Rahim’s averages out to 4.4/5. I wud love to revisit. Try not to miss it if in Lucknow. When you eat Nihari, it is one thing and when you eat Kulcha-Nihari at Rahim’s Lucknow, you will understand what I mean. 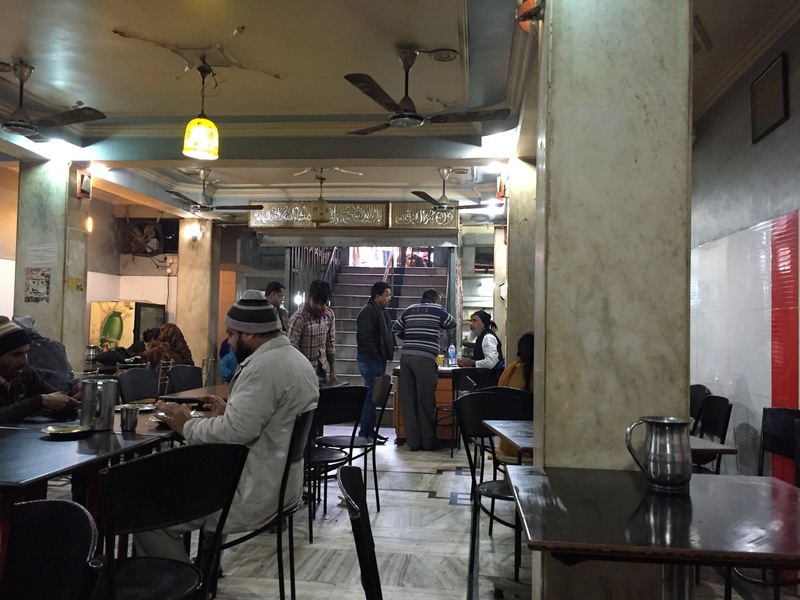 This time at Lucknow I wanted to look beyond the usuals – Galauti, Biryani,Kakori,etc..
As the winter had set in , I wanted to eat Nihari and my local acquaintance guided me to this place. The Kulcha is not like the one you get in Delhi or Amritsar. It is delicately cooked layer by layer and is crisp with a subtle saltiness . 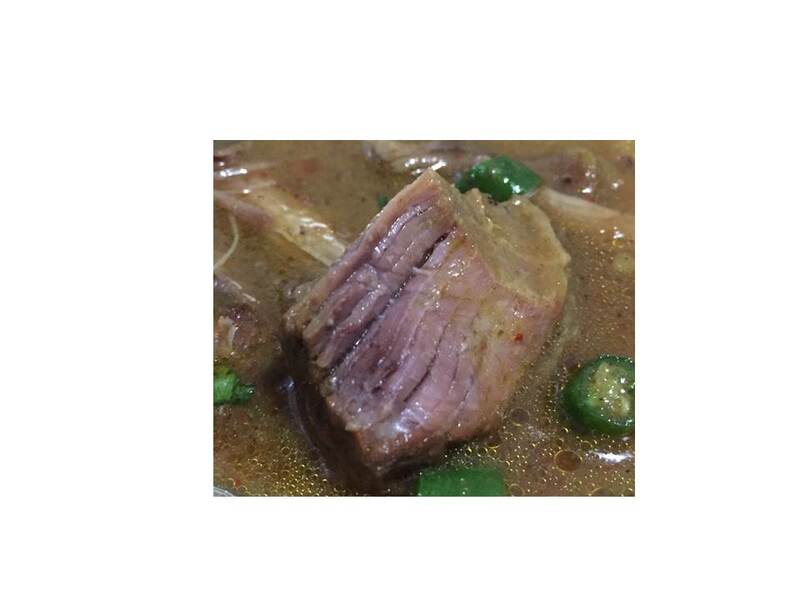 Ideal way is to break it into small pieces, put it in the bowl of Nihari and then eat it like you gulp down a soup. 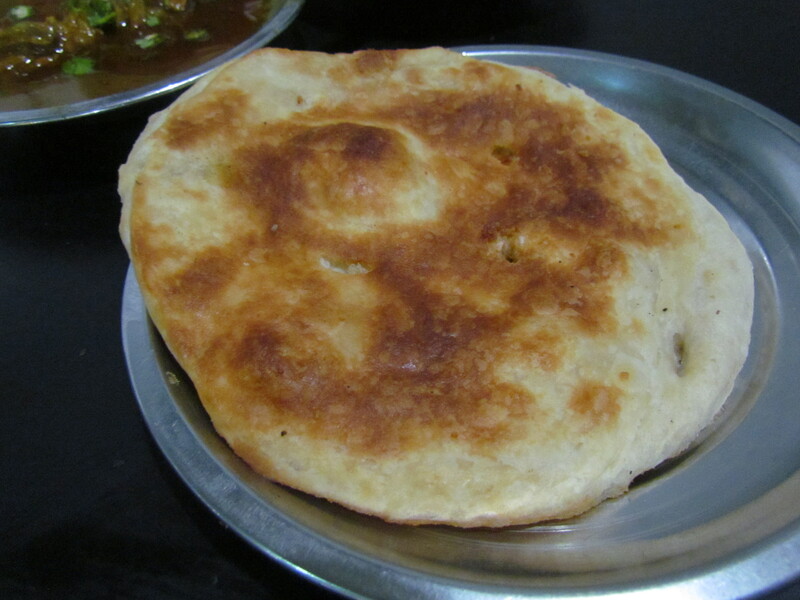 Kulcha itself is so tasty that my veggie friend could not stop having it as standalone option. Nihari was simple and not over the top. But it did preserve the taste of the mutton and not spicing it . Light gravy as you would want your Nihari to be and do ask for separate portion of finely chopped green chilly and coriander . Sprinkle them lavishly in the Nihari bowl and enjoy the taste. 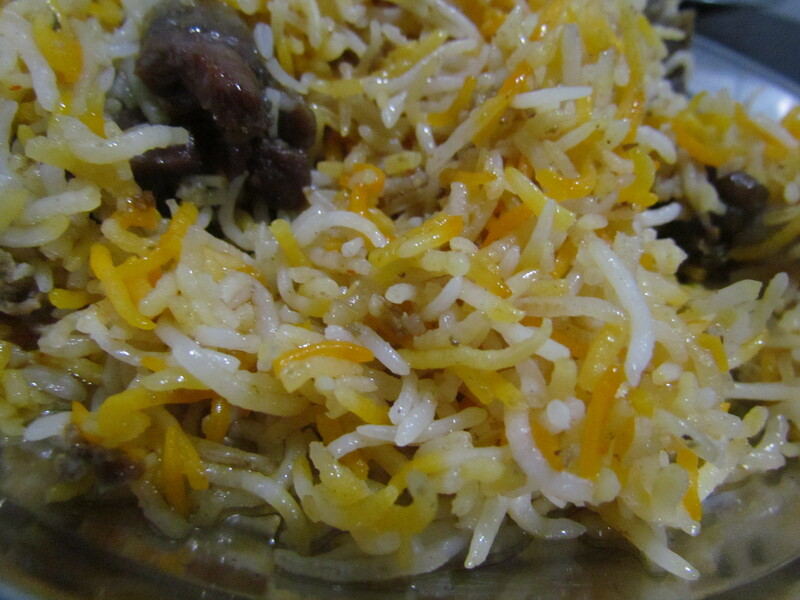 I then could not resist a quarter portion of Mutton Biryani, which was had mutton pieces with juiciness well preserved. Having the biryani with Nihari gravy was awesome. It’s great to have fragrant rice with a delicate gravy. I will be too glad to make this part of my itinerary every time I visit Lucknow . Head straight to Ákbari Gate in Lucknow and ask anyone for Rahim’s. You are sure to miss the place if you don’t keep asking people every 50 steps. But then – it’s worth it. 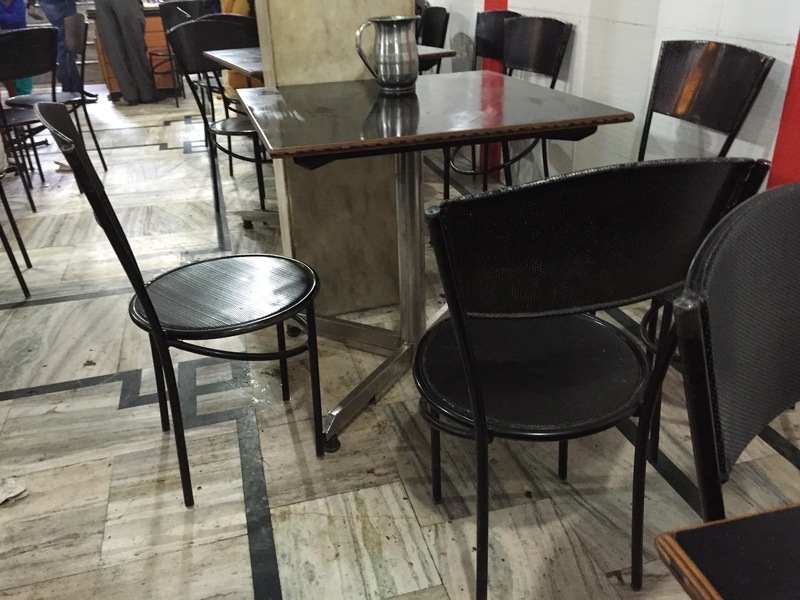 I was blown over by the taste of Nihari at Rahim’s – I cud not believe it cud be so good. Well first things first – I am not a big fan of mutton . I would usually have chicken at all cost, in fact, I am also a vegetarian by preference . So going to Rahim’s shop for nihari was kinda something which was actually against my normal behavior. But then I saw this list which suggested that Rahim’s was the second most important thing in the lucknow cuisine, next to the world famous tunday kebabs. After a bit of mental dilly-dally I decided to go against my veggie bias & give Nihari a try. For the uninitiated, Nihari is a mutton dish with a gravy – mutton is cooked over slow fire overnight with herbs & spices. 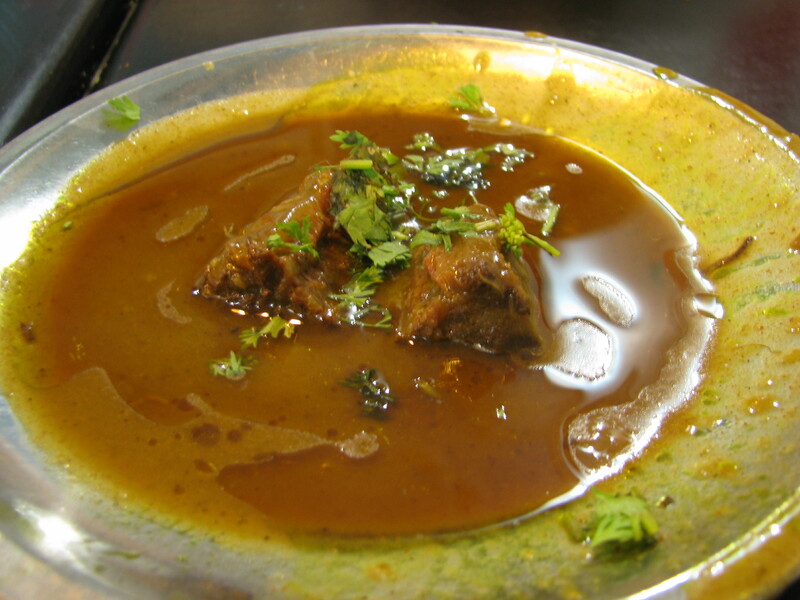 The mutton pieces are usually melt in the mouth & the gravy usually has a very unique flavor than regular mutton curries. We reached Rahim ki Nihari shop at 11.30 am – I thought that we were actually late for the party as nihari is the food of early morning. But at Rahim the nihari is an all-day affair. 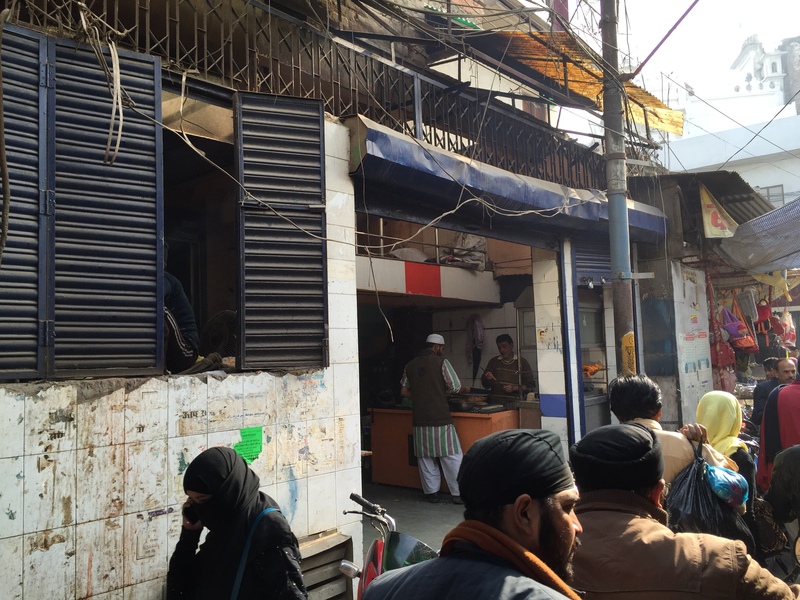 As we entered the lane of Rahim we were greeted with the usual no sign board of ‘mashoor world famous’ – As expected after our Idris ki Biryani experience, the shop had no sign-board or even any name. What’s interesting to know is that everyone around knows about Rahim’s shop & its location. 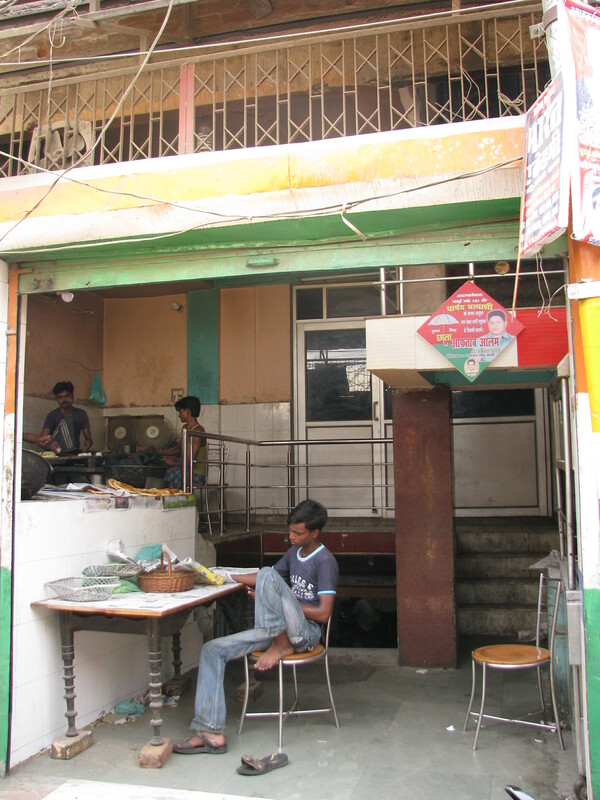 I think this subtleness of Lucknow reflects in it’s cuisine as well. 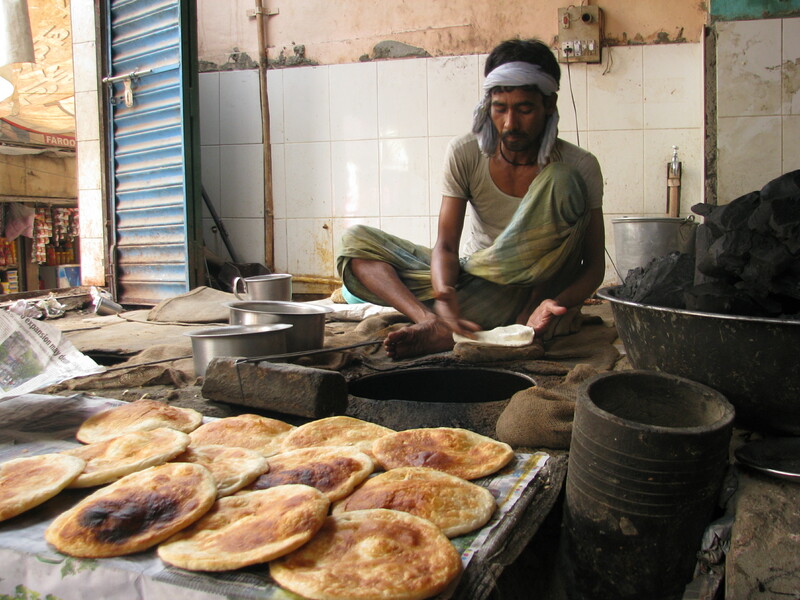 Enter Rahim and you are greeted with a tandoor/oven with freshly baked kulchas coming out constantly. 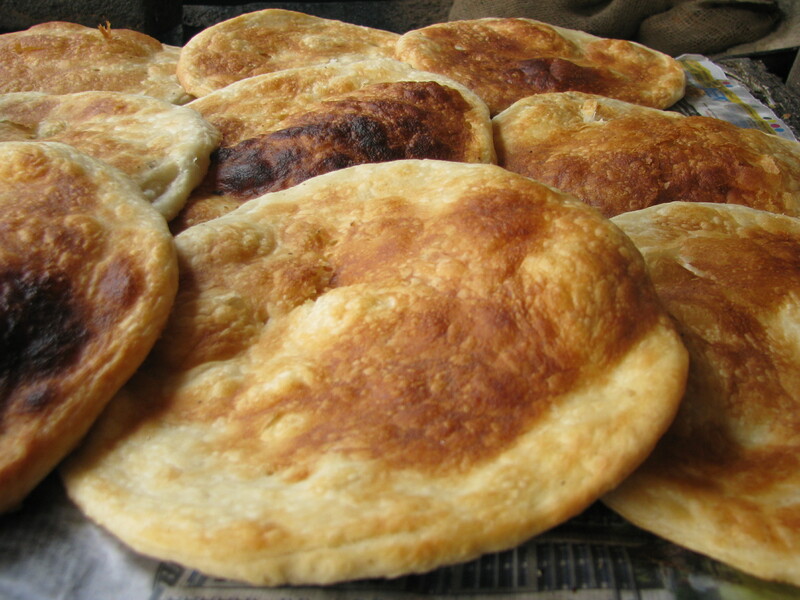 The kulchas looked crusty on the top with a warm red top and spongy bottom – It can probably give any german bread a run for its money. 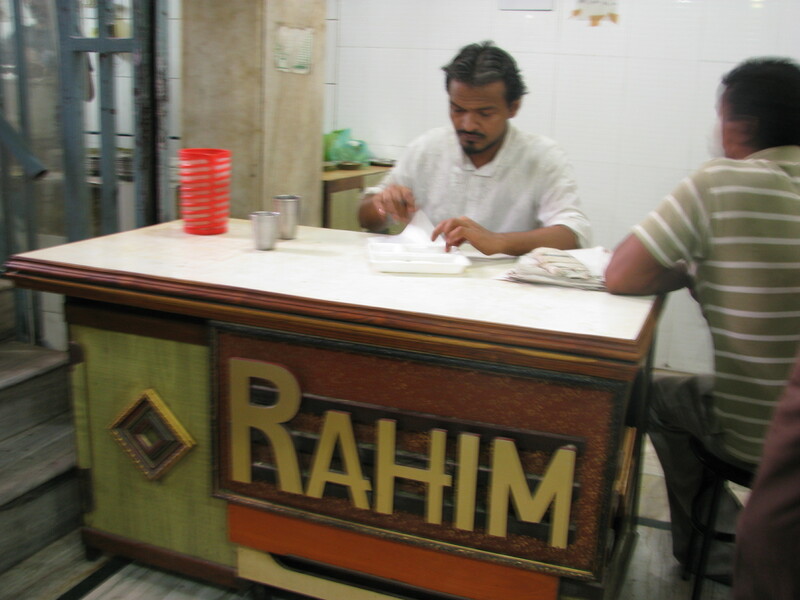 As we moved into the eating area few steps below , we were greeted with the branding of Rahim on the cash counter and only one in the entire place. I was pleasantly surprised. I walked into the shop straight towards a smiling gentleman seated on the counter . With a gentle adaab I started asking him about the place . The place, he told, is around 80 years old . This man was the 3rd generation owner. I asked him what keeps him going – there are so many other ways he cud have earned the same money rather than sticking to his ancestral profession. He didn’t have a proper ‘verbal’ answer, but one could easily see the pride in his eyes ……………… those eyes spoke a lot. 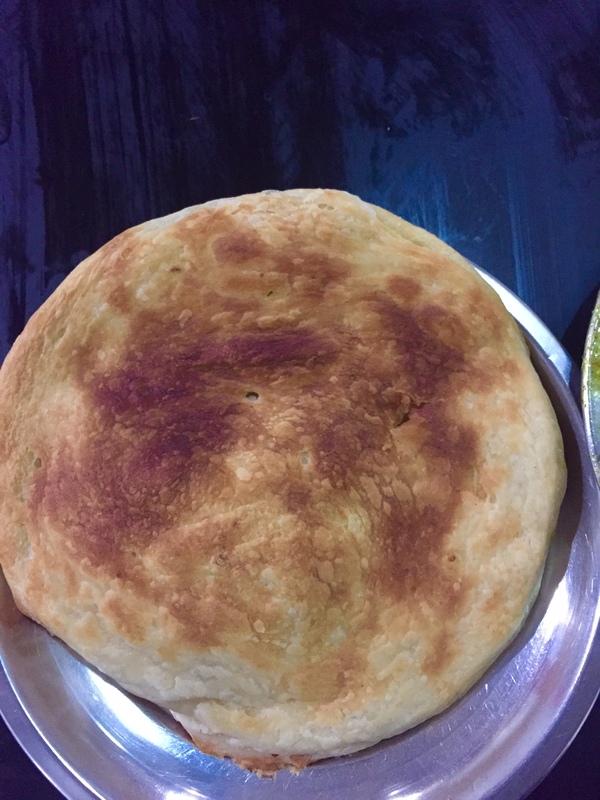 In sometime our food was served – we had ordered ‘2 mutton pieces in a plate’ nihari for each one of us which was just rs 40 a plate and 2 kulchas 6 rs a piece. I soaked my kulcha in the gravy and quickly mouthed it . What I expected was bombardment of flavor. I was anticipating how it would fill up my mouth with this intense flavour. But nothing of that kind happened. 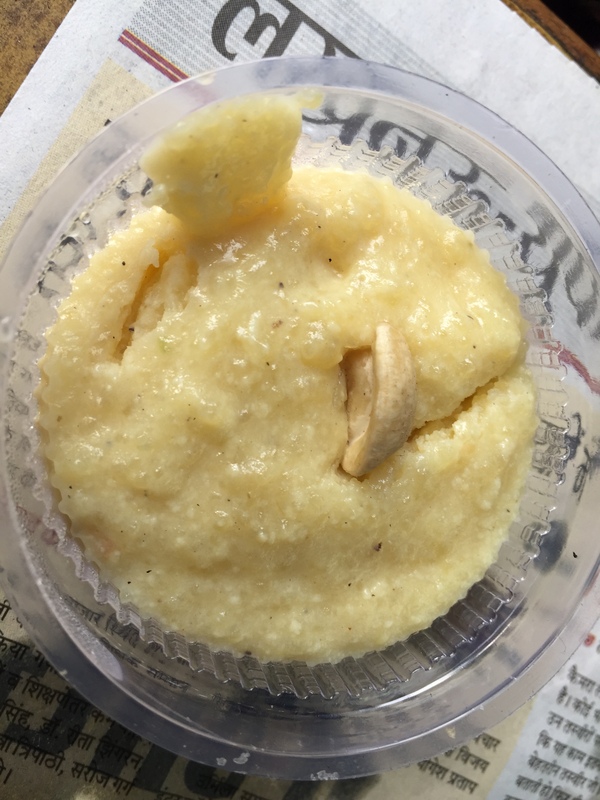 After being taken by surprise post the first 2 – 3 bites, the magic started – well, I could hear this poetry of mild spices inside my mouth. I could easily register the fact that this was cooked for long long time giving the curry a well smooth rounded flavour. I closed my eyes, shut my ears, momentarily cut off my thoughts just to enjoy every bit of it. Soon after, I could hear my tastebuds shouting with joy – ‘this is our best gravy ever’ . 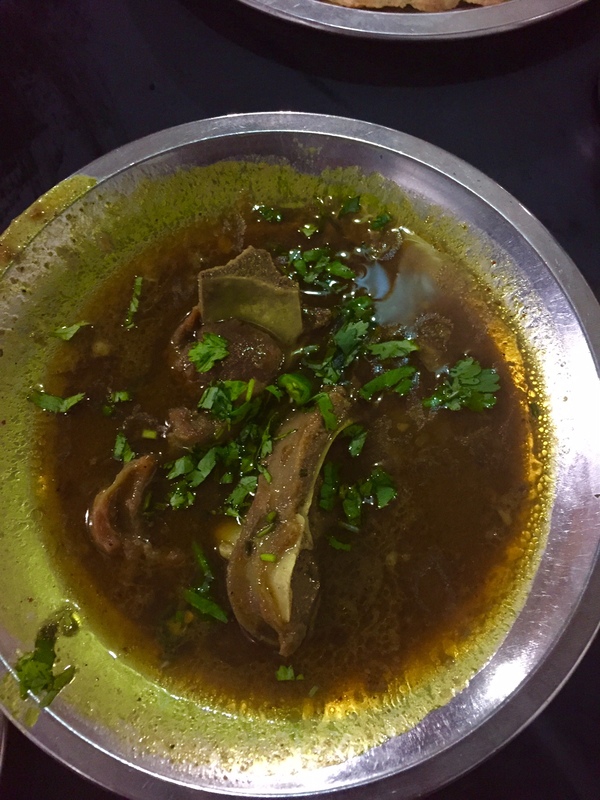 As expected, the mutton was softened and had registered the flavour of the gravy right to the bone – happens only when meat & gravy are cooked together over a long period that allows the flavors to intermingle. My brother in law who accompanied us just for company & with utter disinterest towards nihari, didn’t order anything. 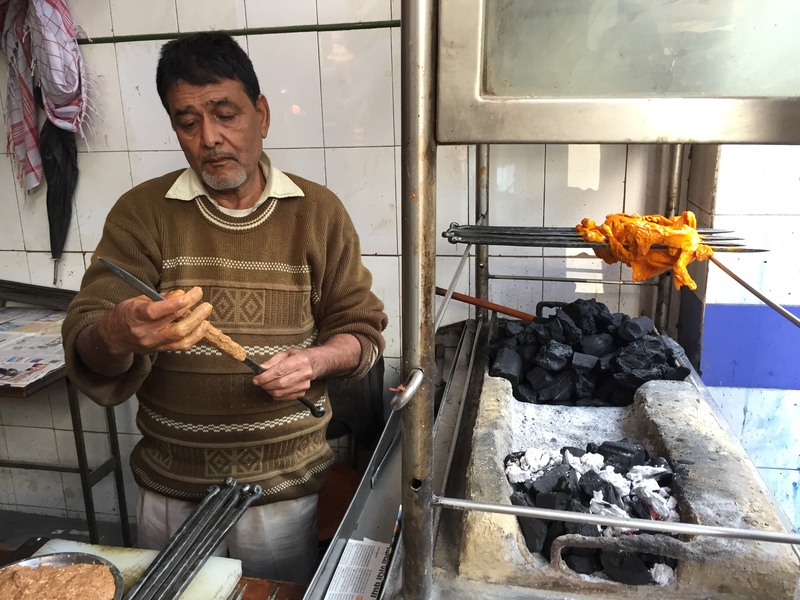 So I invited him just to take a bite – after a few attempts at my salesmanship, I was finally able to persuade him…..to take a bite. What happened post that was ‘history’ – Yes, he ordered a plate for himself and didnt stop till he finished it up all till the last drop. 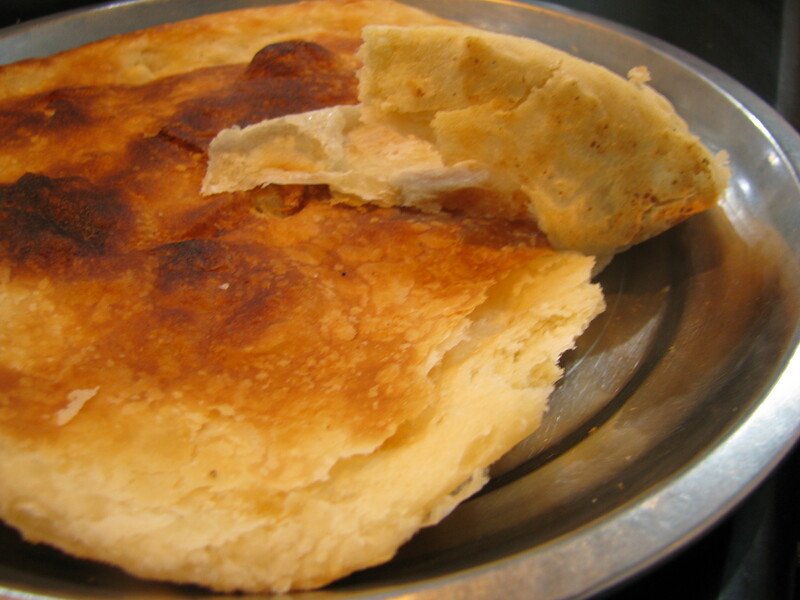 The kulcha was marvelous – I enjoyed the layers & layers within. Loved the experience at Rahim’s shop & will definitely get back there. In Islam, alcohol and other sedatives are considered ‘haram’ (not good). Post the meal at Rahim’s, I was thinking – Why shud someone need alcohol in Lucknow when you have Rahim ki nihaari that is so intoxicating !! That is the extent of impact this food had on me. I would say it is a ‘must eat before you die’ for any foodie. As we went to the counter to order another plate for packing, I again saw the pride in the eyes of the man at the counter – now I know why. While Rahim are the best, I don’t think they serve Mutton Nehari. 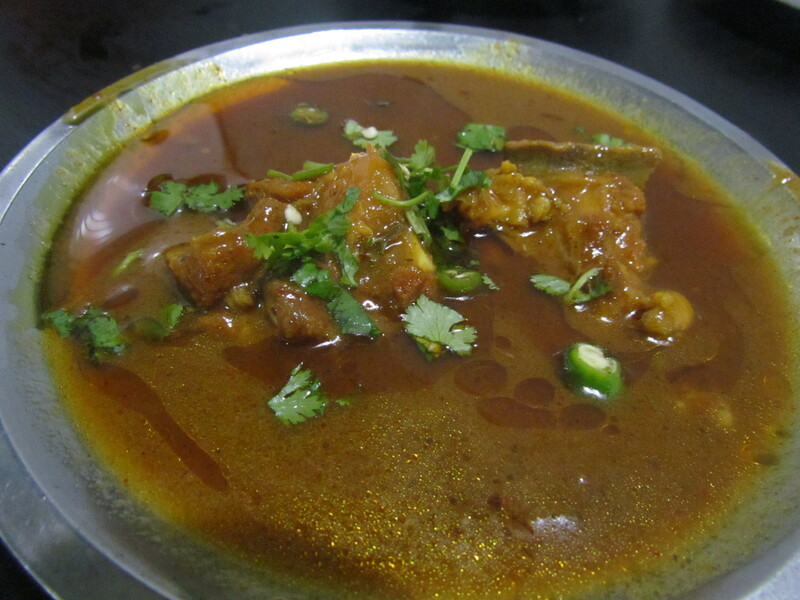 Nehari is made exclusively from Beef (buffalo meat) cooked overnight and eaten in the morning. 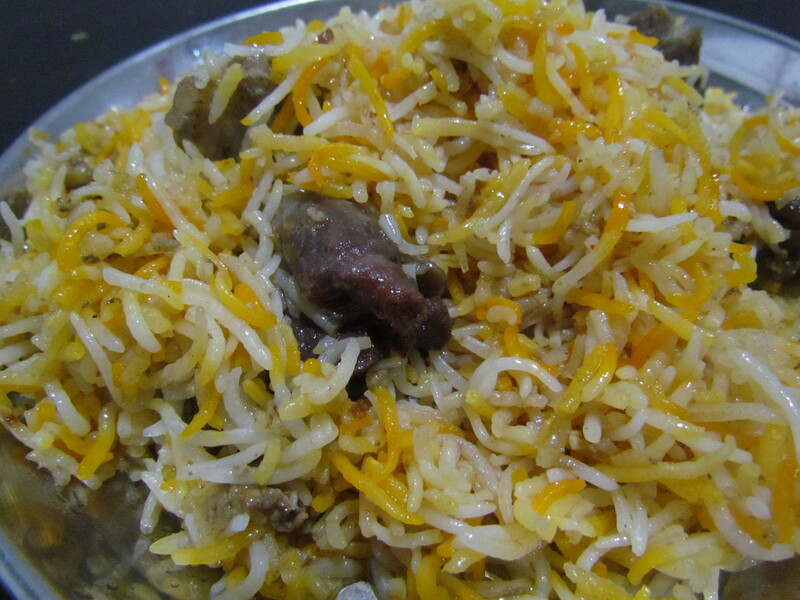 If you are still in Lucknow, don’t miss Idris ki biryani. It is in the Chowk area, near a police chowki. Quite well known in the area. I entered here looking for Kulcha and Nihari served at Raheem’s. Last week I received Traveller Indian edition(feb-mar2014issue) from Mumbai..On page167 they have image of Raheem’s Kulcha and nihari plate. Nihari plate is kept over Kulcha so the top was not visible…I wanted to know more about this kulcha so googled and reached here…Thanks for the detail description and image of the cook preparing Kulcha. I wish to create this dish in my kitchen. 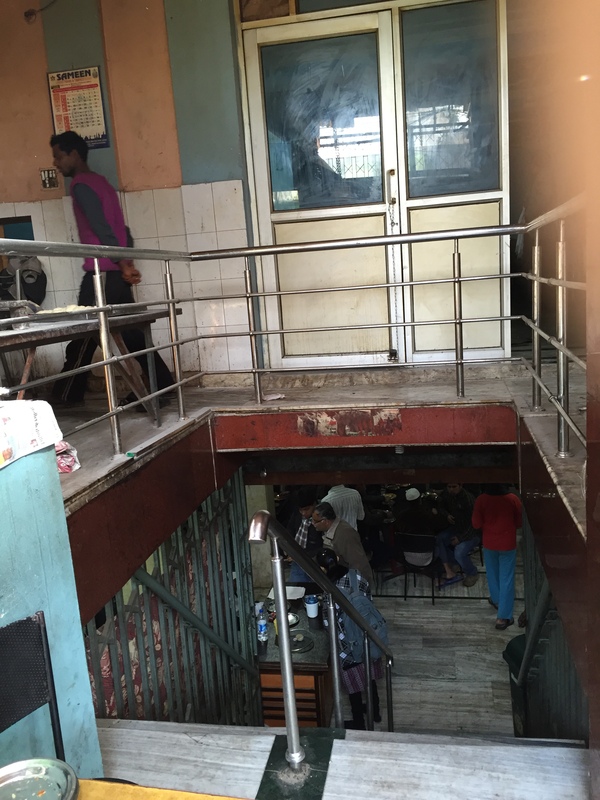 Hi Yummraj, Here is my experience when I went to Rahim’s after reading your blogpost https://mlost.wordpress.com/2015/02/02/the-magic-of-lucknow-rahim-nihari-wale/ Thank you so much for the tip. Ques for you – Is there a way I can join Yummraj on their food explorations? I am a die hard foodie with a great appetite & a taste for all sorts of food available. Awaiting response. Thanks once again! 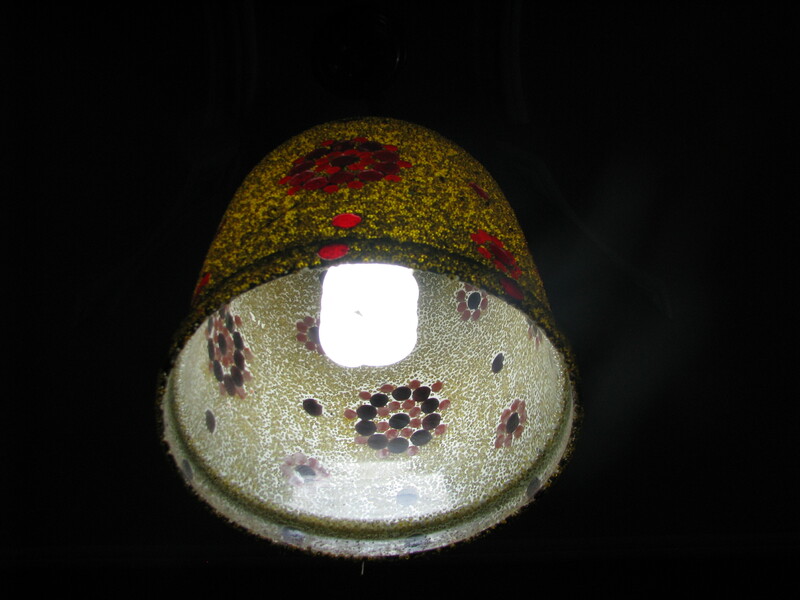 It is really good to hear you enjoyed the nahari in lucknow, i do have a suggestion as i live in lucknow and have tasted nearly a loot of things. 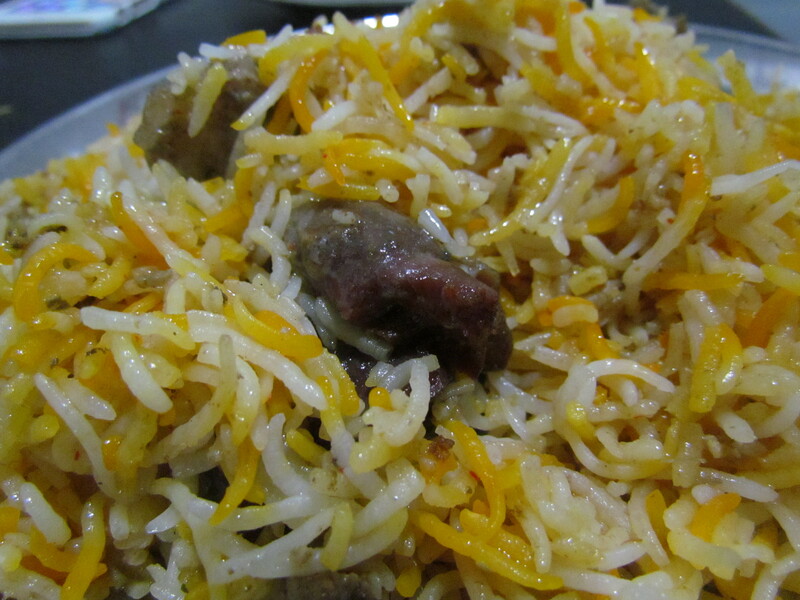 Whenever you come back do try the Paya Nahari, it is mind blowing. Thanks for suggesting, syed. Paya nihari at Rahim’s or some other place? 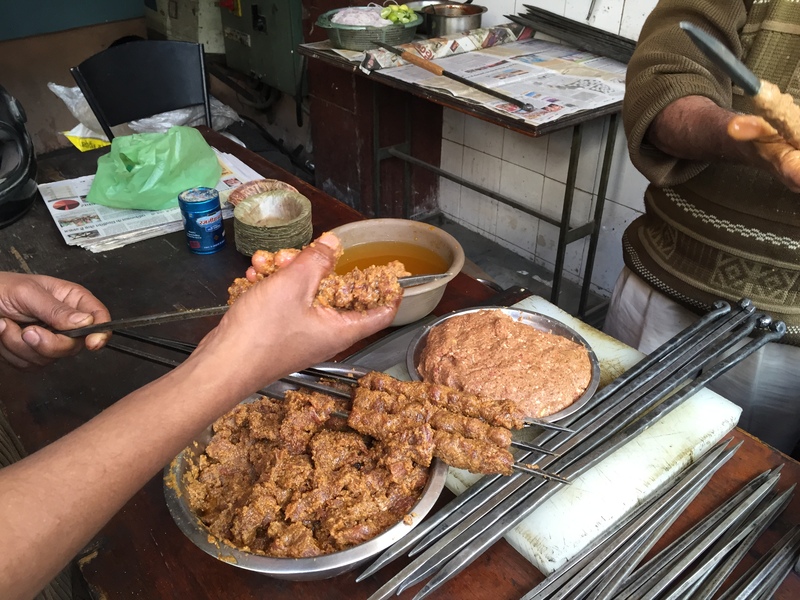 Very well informed blog about nihari kulcha. I really love this place.